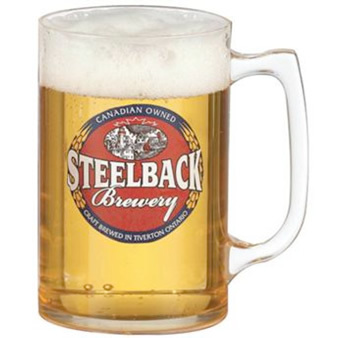 These 16/18 Ounce Classic Plastic Beer Mugs feature smooth walls. The Mugs are made of thick, durable, molded SAN (styrene) plastic, which is BPA free. SAN plastic is also heat and scratch-resistant, making these Custom Plastic Mugs the right choice for repeated use and dishwasher cleaning. Your one- to four-color design is imprinted on one side of each Beer Mug. Perfect for bars, restaurants, clubs, promotions, Oktoberfest and other special events, outdoor service, and much more, our Custom Plastic Mugs offer a great way to promote your business or organization while allowing your customers to enjoy a pint of their favorite brew! It's easy to get started with your Custom Plastic Beer Mugs – simply call 1-800-233-0828. Then e-mail us your camera-ready artwork. The minimum order is 150 Plastic Mugs and production time is about two weeks after proof approval. Rush production and delivery is available. Your satisfaction is guaranteed when you order Customized Drinkware from us. 166PR Custom 16/18 Oz. Plastic Classic Beer Mug 2.79 2.69 2.63 2.53 3" 3"
For more information on Customized Plastic Drinkware please contact us toll free at 1-800-233-0828. You might also be interested in viewing our wide selection of other Custom Plastic Mugs, including other Beer Mugs and Beer Sampler Mugs, Cowboy Boot Mugs, and German Beer Mugs.